a Close To My Heart Consultant? Well, if you have, this is the time to do it! At Close To My Heart, there is a place for everyone! 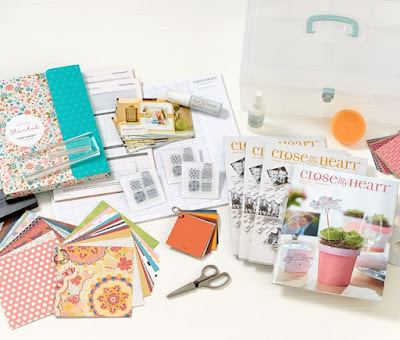 Are you a hobbyist who would like a great discount (22%) on your crafting supplies? Are you a paper crafter who wants to make a little bit of extra money to help pay for your paper and crafting obsession (like me), or just to have a little extra spending money? Are you interested in building a business that takes you all the way to the top? Whatever you are looking for -- it's here for you! $50 Select Product Credit for your choice of supplies to start out on the path (scrapbooking or card making) that you would like. And only during April, you can also earn your choice of a FREE Cricut® collection or an additional $100 in Select Product Credit when you submit $350 in personal sales within your first 30 days. Close To My Heart consultant? As an added resource from Close To My Heart during April’s Recruiting Campaign, CTMH will be hosting four live webinars throughout the month that will explaining the perks and benefits of becoming a consultant. During the webinar, Kristina Livingstone will walk through the contents of the New Consultant Kit, talk about the Consultant discount, explain how new Consultants can earn free products, and answer the most frequently asked questions. Those who join the webinar will come away understanding what an incredible opportunity it is to join Close To My Heart. 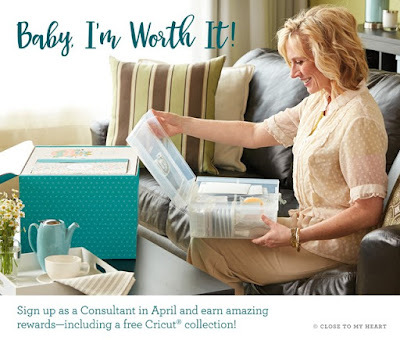 I'd love to have you as a part of my team.